Eagle MHC's High-Density Floor-Trak™ System is specially designed to maximize space. This versatile track-and-skate system enables material managers to optimize the storage of supplies, parts and other items where there is a need to store a high volume of goods in the most space-efficient manner. Eagle MHC's High-Density Floor-Trak™ System's new design is specially designed to maximize space. This versatile track-and-skate system enables material managers to optimize the storage of supplies, parts and other items where there is a need to store a high volume of goods in the most space-efficient manner. The system is simple to install, and is designed to accommodate the broad mix of wire shelving products (post heights up to 86 inches), or high-density polymer LIFESTOR® shelf sections. The low-profile, non-corrosive track is constructed of extruded aluminum with stainless steel inserts. Industrial-grade bearings allow loaded shelving units to glide effortlessly over the tracks for smooth sailing, every time. Specially engineered shock-absorbing end-stops ensure that the shelving is always securely braked at the end of the track line. The system's open construction easily accommodates the use of cart covers, if desired. Eagle's new Floor-Trak™ system is designed to allow for add-on tracks and shelving units as storage requirements grow. With this system each shelving unit can hold up to 2000 lbs. This design allows the restrictions to be removed for additional shelving units based on height and depth, giving more versatility in meeting individual uses and needs. 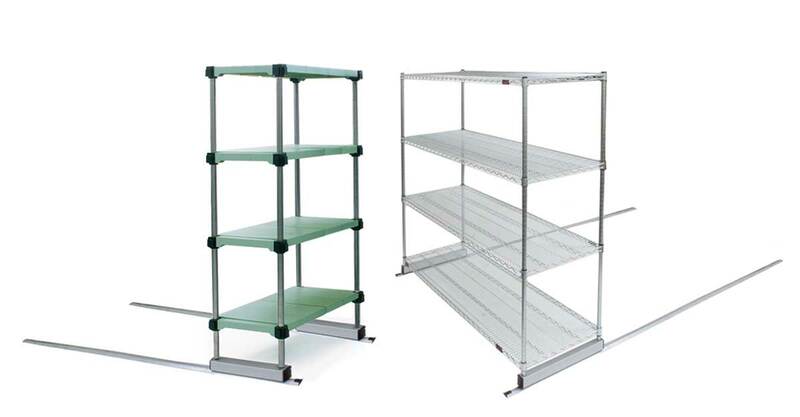 Systems using wire shelving can be designed in a double deep configuration without impeding rollability. New High-Density Floor-Trak™ systems from Eagle MHC are ADA-compliant and NSF-approved for sanitation, making them ideal for a wide range of uses - from manufacturing plants, warehouse facilities and office buildings to healthcare facilities and educational institutions. When using the Floor-Trak™ system in combination with open-wire shelving, better visibility is achieved by the light passing through the shelves. Also, air circulation reduces moisture and dust buildup. The open-wire shelf construction effectively eliminates puddling in the event of activation of fire suppression systems. For more information, contact Lynda Donavon (ext. 3027) with sales inquiries, or Eagle's Marketing Department (ext. 3129) with inquiries pertaining to marketing support. Telephone: (800) 637-5100 or (302) 653-3000. FAX: (302) 653-3036. Web site: http://www.eaglegrp.com.